How to Stream iTunes M4V Video to TV with Roku 3? "When it comes to popular media streamer, I will immediately think of Roku 3 streaming box. The Roku 3 seriously changes the way of accessing my favorite videos from more than 1,000 online channels, like Netflix, Amazon Instant, YouTube and more. Its distinctive cross-platform search feature enables me to get any content from multifarious media folder with a tile or keyword. A more humanized design is the built-in headphone jack, which can mute my TV automatically when I am listening to avoid disturbing others. However, all of these features are beside when comparing with the USB channel. It lets me play local videos on big TV with the USB port. But a question is that no movie or TV show downloaded from iTunes store can be played successfully with Roku 3. 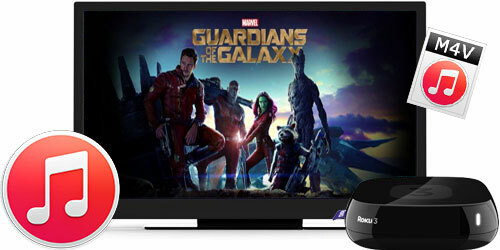 I’m really pleased with the functions of Roku 3 media streamer other than this problem." The above comment is from a Roku 3 user recently, who is certainly not the only one that having the trouble of streaming rented or purchased iTunes M4V videos with Roku 3 USB channel. AVS4Mac is here to help you right now! What you need to find out at first is that the video formats working well with USB channel are only some common ones, such as the common MP4, which is not fit for iTunes videos in special M4V format naturally. Moreover, iTunes videos, both rented and purchased, are under protection of Apple FairPlay DRM all the time to prevent playback freely. Therefore, before converting iTunes M4V format to plain M4P supported by Roku 3 USB channel, you must remove the DRM clearly. AVS4Mac iTunes M4V to MP4 Converter allows you to get rid of all DRM protection for iTunes rented and purchased M4V videos and convert to popular M4P at 20X faster speed. Such super-high conversion speed would be bad for keeping original quality? NO! You can a get 100% lossless M4P output with all subtitles and 5.1 audio track preserved. Preparation: Freely download and install AVS4Mac iTunes M4V to Roku Converter ( Mac OS X 10.10-10.8; Windows OS 8/7/Vista/XP ). After started the software, iTunes would be opened automatically. Click "Add Movies" button to import desired iTunes M4V	videos. It is suggested to choose "Same as Source for MP4" as output format, which is able to keep high video quality as orignal. When you are ready, just click "Convert" tag to start removing DRM from iTunes M4V and convert to MP4. After the prograss bar reaches 100%, move to "History" to get the DRM-free video in MP4 format, and transfer it with a USB port for streaming to HDTV freely. If you also want to enjoy the converted MP4 video on other proper devieces or convert iTunes M4V movie, TV shows to other formats, come here to get an answer!